As you add new elements to a diagram, you might want to move the existing elements to create more space, make a structure more apparent, or create a child-parent relationship between two elements. 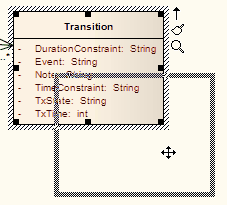 There are several ways in which you can move the elements within the diagram. If you want to make one element the child of another, you can drag the child onto the parent; the child is then always encapsulated by the parent and moved within the parent. To confirm that the proposed parent element is able to accept the selected child element, observe the parent element border as you drag the child element over it. 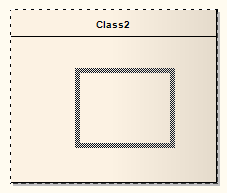 If the parent can accept the selected element as a child, the element border changes to a dashed line. If the border does not change, the selected element cannot be a child to the parent element.